At last nights Chicago Bulls vs Sacramento Kings game I found the one Kings fan who wasn’t ready to give up the Peja Stojakovic era. Peja hasn’t been on the team since the 05′-06′ season and since then he’s been on four other teams (Pacers, Hornets, Raptors, Mavericks). That means that this Peja Stojakovi jersey is 6 years expired which is about 5 too many to wear (you get a 1 year grace period and even that is debatable) and about 4 too few to be Hoopster cool (awesome for the obscurity/randomness of it). 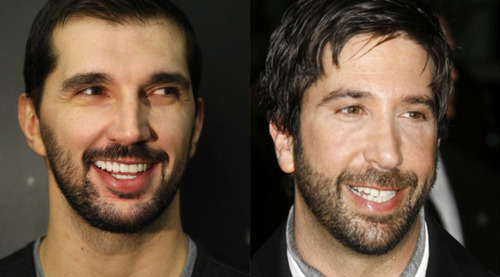 Peja, who is a dead ringer for Ross from Friends, was originally drafted in 1996 by the Kings and was taken one pick after Kobe Bryant and one pick before Steve Nash. He has since retired from the NBA after having made over $97 million in his career. He now gets to live the rest of his life with all this money and his Greek model wife Aleka Kamila.